In a Nutshell: Today’s consumers can purchase products from anywhere with internet access, and companies looking to thrive in this environment can no longer rely on traditional payment processing technology. 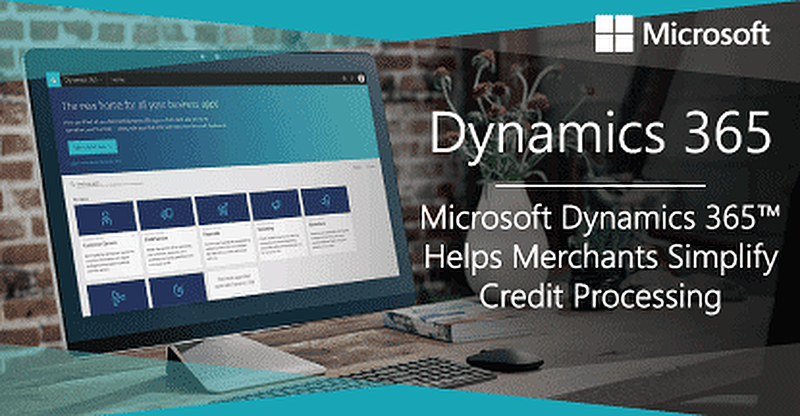 Microsoft Dynamics 365 for Financials offers a new platform for processing credit cards and other payment methods, including debit cards, gift cards, electronic checks, and PayPal. This single-source solution streamlines payment processing by eliminating the need for additional equipment, third-party gateways, and redundant data entry. And, because the payment processing functions are fully integrated with all of Dynamics 365’s other business management applications, merchants who invest in the new software suite can see huge boosts in speed, productivity, and efficiency in areas like sales, purchasing, inventory, and project management. Running a business is a complicated affair. With so many responsibilities — management, marketing, sales, accounting — it’s easy to overlook one of the most essential aspects of business success: getting paid. Effective payment processing is not only critical for a company’s finances, it has major customer-service implications, as well. Both of these arenas require that payment processing be as simple, secure, and efficient as possible. And, with so many new payment methods available, it must also be highly flexible to accommodate the latest trends and technology. It’s not exactly a newsflash that credit cards are now the preferred method of payment for many consumers. Today’s merchants are all too familiar with the considerations surrounding credit card payments — terminals, security, bank requirements, gateways — and most have already found a processing system they’re comfortable with. However, a groundbreaking new software suite from Microsoft could be a game changer, not just for payment processing, but for most facets of business management. Microsoft Dynamics 365 for Financials, released November 2016, is a cloud-based enterprise software solution that integrates all of a company’s business management applications into a single platform. Dynamics 365 combines the functions and features of both enterprise resource planning (ERP) and customer relationship management (CRM) software into one seamless system, providing merchants with huge boosts in speed, productivity, and efficiency. Microsoft Dynamics 365 combines payment processing with CRM and productivity software integrations. Beyond these core capabilities, Dynamics 365 for Financials can be expanded and customized by adding apps and extensions available through Microsoft’s online AppSource store. Included in this collection of add-ons are several payment processing applications that directly integrate credit card payments with all of the suite’s other systems — inventory, sales, customer service, finances, and project management — offering a new, streamlined way to process payments and share valuable information across multiple databases. Whether you’re a consumer or a business owner, effective payment processing boils down to three key factors: simplicity, security, and efficiency. Nothing sends potential customers running for the hills faster when shopping online than websites with untrustworthy or overly complicated payment processing. Even if a system is simple and safe, slow transaction times, system crashes, and the inability to accept today’s diverse range of payment methods can lead to dissatisfied shoppers. Today more than ever, consumers are demanding higher levels of customer service, and payment processing is a key part of their shopping experience. The latest advances in ecommerce and mobile credit card processing allow customers to purchase goods and services from anywhere with internet access. It’s no longer practical for merchants to rely on traditional credit card terminals and other outdated methods for processing payments, and this is true not only in terms of offering superior customer service but also for improving a company’s internal business practices. The Dynamics 365 for Financials payment applications available through AppSource provide multiple solutions for easy and secure payment processing across all sales channels, including POS, ecommerce, and back office. Moreover, these payment applications are fully integrated with Dynamics 365’s ERP and CRM solutions, turning multiple disconnected systems into one. The ChargeLogic Payments extension provides an easy, secure, and reliable payment processing solution that integrates with Dynamics 365 for Financials and directly connects to major payment processors across the globe. This single-source connection eliminates the need for third-party software or gateways, payment terminals, and other external hardware. With fewer connections, customers will experience fewer delays and a speedy average transaction time of two seconds or less. The ChargeLogic extension is a secure, efficient integration for accepting credit card payments. ChargeLogic boosts efficiency and accuracy for merchants by eliminating duplicate data entry, which helps to reduce errors. Integrated directly with the order processing workflow, credit card authorization approvals are provided at the time orders are placed, and the system automatically captures funds when orders are shipped and invoiced. For repeat customers, default credit cards can be automatically authorized when an order is released to the warehouse, eliminating extra processing steps and saving merchants both time and money. ChargeLogic is PCI compliant and regularly undergoes audits by the PCI Security Standards Council. The payment software encrypts sensitive customer account information, while still allowing recently used credit cards to be safely stored for easy reference. Additional security functions, such as address verification, card verification value matching, and fraud protection, help identify risky transactions before an order is shipped. With solutions for retail, phone, ecommerce, mobile, and mail orders, ChargeLogic lets merchants manage payments across every sales channel while accepting credit cards, debit cards, gift cards, EBT, and electronic checks. At the same time, customer data — payment history, receipts, and credit card information — is integrated within Dynamic 365’s other business applications, which makes managing orders, sales, invoicing, and reporting significantly easier and faster. Another way Dynamics 365 for Financials provides improved payment processing is through its PayPal Payments Standard extension. This app allows a PayPal link to be added directly to sales documents, giving customers another quick, easy, and secure way to pay, while providing merchants with increased efficiency. During the billing process, PayPal links can be automatically embedded into every invoice document or added manually to selected ones. The link takes customers directly to the PayPal website, with the product information and amount due prepopulated. PayPal is not only a highly popular payment service customers are familiar with and trust, it also offers multiple ways for payments to be made — including credit cards, debit cards, and bank transfers. Embedding PayPal links into invoices makes for an efficient payment process. Along with enhanced customer service, the extension also reduces the time it takes for payments to post to a merchant’s bank account. What’s more, PayPal doesn’t require any set-up charges or monthly fees, which can lead to reduced costs, as well. Because Dynamics 365 for Financials integrates with Microsoft Office 365, merchants can create quotes, process orders, and submit invoices all without ever leaving Outlook. They can also export data and create documents within other familiar MS Office applications, such as Excel and Word. Such deep integration makes the sales process quicker and more efficient, as sales teams would otherwise need to use separate applications to create quotes and invoices and then re-enter that data into an email, which can be time-consuming and lead to data-entry mistakes. Using Dynamics 365, however, customized sales quotes can be created and converted into invoices directly from Outlook. Productivity is further boosted by the ability to add PayPal links to invoices for expedited payments. Dynamics 365 for Financials’ cutting-edge solutions for payment processing offer the highest levels of simplicity, security, and efficiency. By streamlining and automating multiple steps in the payment process, the software suite cuts down on the time, cost, and human error that often come with traditional payment technologies. This frees up valuable time and resources, so merchants can focus more on growing their companies and boosting revenues. Microsoft’s new software suite can help with these big-picture responsibilities, as well. From sales and inventory to accounting and purchasing, Dynamics 365 for Financials’ wide range of business management applications can help improve productivity across all operations. Moreover, the seamless integration of data across so many channels provides merchants with a comprehensive overview of their business that will allow them to maximize their company’s performance.